Traditional omelets have far more fat than egg-white omelets. 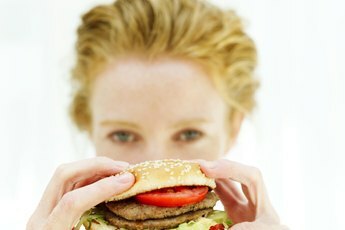 You can follow virtually any diet and lose weight -- initially. According to a 2012 report published in the "Journal of the American Medical Association," however, only one in six adults maintains at least 10 percent of that weight loss for one year. The report also noted that a high-protein diet is more effective at keeping weight off than one high in carbs. A diet that features the pure protein of egg whites makes it easier to keep off unwanted weight and maintain muscle mass. Replace protein sources high in fat with egg whites. Low-carb diets work in part because dietary protein and fat signal to the brain that food has been consumed more quickly than carbs do, so you feel full faster. Egg whites accomplish this with far fewer calories than other natural high-protein foods because they contain no fat, and fat has 225 percent more calories per gram than protein. 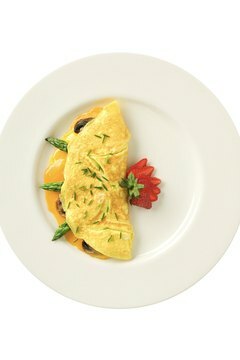 Three large eggs used in an omelet add 204 calories, 140 of which come from fat. Three large egg whites, however, add 51 calories and none comes from fat. Eat egg whites frequently, and you can also boost the thermogenic effect of food. Thermogenic refers to the production of heat, but in the case of diet, it refers to speeding up the metabolism -- and, importantly, increasing calorie burn. Ingest simple carbohydrates and fats, and your body burns about 4 percent of those calories to process the rest. 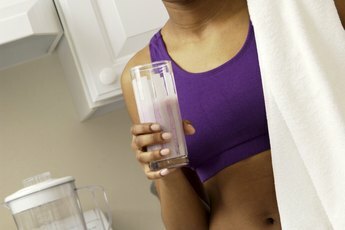 Consume lean protein sources such as egg whites, however, and your body burns far more. One hour after eating a high-protein meal, your metabolic rate increases as much as 30 percent for up to 12 hours. A typical American diet, however, only burns about 8 percent of its calories through the thermogenic effect. Feature egg whites for breakfast. 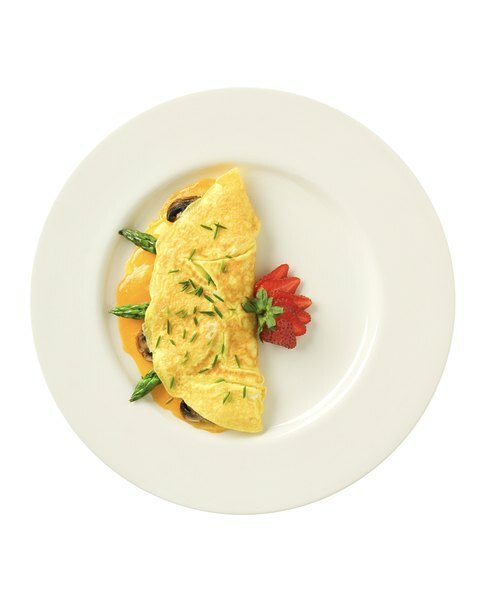 Eat six in an omelet or scrambled, and you’ll have a filling main course that only contains 102 calories. 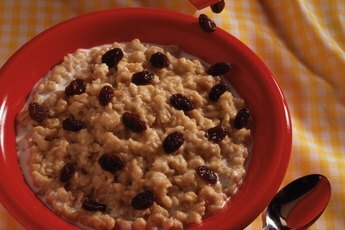 If you eat oatmeal for a change of pace, add one or two egg whites while cooking. If you hunger for French toast, replace the egg yolks in the recipe with extra egg whites. Exchange the cheese in your lunchtime salad with hard-boiled egg whites. Two ounces of cheddar, for example, contain 228 calories, 169 of which are fat. Using three sliced, hard-boiled egg whites instead saves 177 total calories, including169 calories from fat. Or eat three hard-boiled whites with a bit of mustard and a medley of raw vegetables for an exceptionally low-calorie meal. Substitute egg whites for other protein sources at supper. Eat 3 ounces of lean, broiled tenderloin beef -- the same amount of food by weight as three large egg whites -- and you consume 212 calories, 99 of which come from fat. The same amount of roasted chicken breast contains 193 calories, 68 of which come from fat. Three ounces of Atlantic salmon cooked by dry heat yield 175 calories, including 95 from fat. Eating egg whites actually helps you burn fat. This occurs because eating egg whites does not cause a secretion of insulin, the hormone that supplies the muscle cells with nutrients and stores the excess as fat. Instead, eating egg whites activates insulin’s opposite, glucagon, the hormone that causes stored fat to be burned as energy. The more severely you diet, the more important it is to eat high-protein foods like egg whites. When your body interprets dieting as famine, it will hoard body fat and break down muscle mass for energy. This compromises long-term success because less muscle means a drop in basal metabolic rate. A 2012 review of dietary studies published in “Advances in Nutrition,” however, found that eating more than the suggested amount of daily protein during a diet spares muscle mass. Bowes & Church’s Food Values of Portions Commonly Used; Jean A. T. Pennington, Ph.D., R.D. Textbook of Medical Physiology; Arthur C. Guyton, M.D. The Insulin-Resistance Diet; Cheryle R. Hart, M.D., and Mary Kay Grossman, R.D. Kevin Kolodziejski began his writing career in earnest in 1989. Since then he's written a weekly health and fitness column and his articles have appeared in magazines such as "MuscleMag," "Ironman," "Vegetarian Times," and "Bicycle Guide." He has Bachelor and Masters degrees in English from DeSales and Kutztown Universities. Where Are Starches Stored in the Body?